Florida’s governor announced plans Friday to put more armed guards in schools and to make it harder for young adults and some with mental illness to buy guns, responding to days of intense lobbying from survivors of last week’s shooting at a Florida high school. Gov. Rick Scott unveiled his school safety proposals as teachers returned for the first time to Marjory Stoneman Douglas High School since the shooting nine days ago that killed 17 people. While criticized by some as not going far enough, the measures were significant in a state that hasn’t passed any type of gun control since Republicans took control of state government in 1999. The shooting sparked an intense push to restrict access to assault rifles fueled by student activists who swarmed the state Capitol demanding concrete gun control measures. President Donald Trump said repeatedly Friday that he favored arming teachers to protect students, an idea many educators rejected out of hand. Scott, a Republican widely expected to run for the Senate, outlined his plan at a Tallahassee news conference. In addition to banning firearm sales to anyone under 21, the governor called for a trained law enforcement officer for every school — and one for every 1,000 students at larger schools — by the time the fall 2018 school year begins. 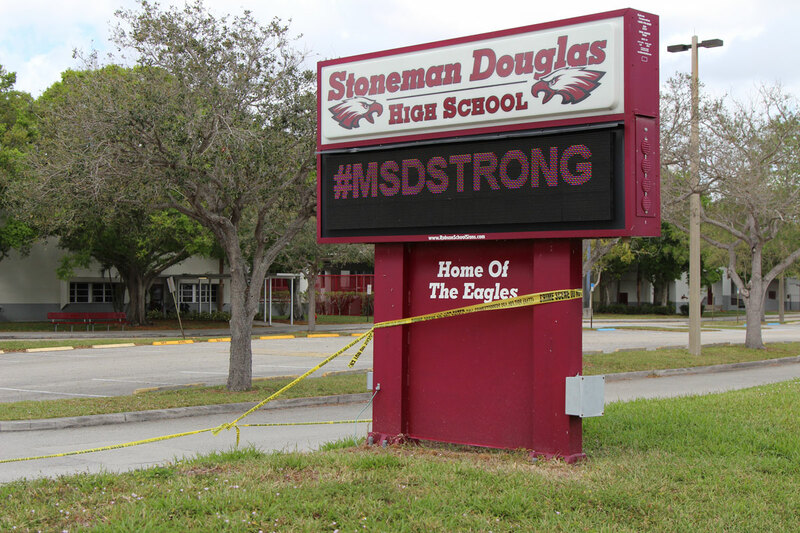 Stoneman Douglas High School in Parkland, which has more than 3,000 students, had one armed resource officer who never entered the building under attack while a gunman was shooting people inside, officials said. That failure was compounded by confusion about what was being shown to police on school security cameras the day of the shooting and the lack of meaningful response to reports to the FBI and local police that 19-year-old suspect Nikolas Cruz might become violent, had guns and possibly would attack a school. Florida’s House speaker called it an “abject breakdown at all levels.” Cruz is jailed on 17 counts of murder and has confessed to the shootings, investigators say. Among other things, the governor’s $500 million plan would create a “violent threat restraining order” that would let a court prohibit a violent or mentally ill person from purchasing or possessing a firearm or any other weapon under certain circumstances. The proposal would also strengthen gun purchase and possession restrictions for mentally ill people under the state’s Baker Act, which allows someone to be involuntarily hospitalized for up to 72 hours. Scott is seeking $50 million for initiatives that include expanding mental health services by providing counseling, crisis management and other mental health services for youth and young adults. “No one with mental issues should have access to a gun. It is common sense. It for their own best interest, much less the best interest of our communities,” Scott said. The governor’s plan made no mention of arming teachers on school grounds. However, the Legislature’s Republican leadership proposed letting teachers carry a gun if they have had law enforcement training. The legislators’ plan also calls for a three-day waiting period for most gun purchases, with exceptions. Democrats said neither plan goes far enough. Talia Rumsky, a 16-year-old Stoneman Douglas High student who was at school during the shooting, was among those who travelled to Tallahassee on Wednesday to lobby lawmakers about gun control. She said Scott’s plan to make it illegal for anyone under 21 to purchase a gun is a start, but said she doesn’t think it goes far enough. Trump told reporters Friday that schools need some kind of “offensive” capability to deter and respond to attackers. “If they’re not gun free, if there are guns inside, held by the right people, by highly trained professionals, you’re going to see this end. It won’t be happening again. Our schools are essentially gun-free zones and that makes them very dangerous places,” the president said. On Friday evening, Marion P. Hammer, former president of the National Rifle Association and longtime Florida lobbyist, issued an appeal to gun enthusiasts titled, “EMERGENCY ALERT! Don’t Let Them Blame You For Parkland.” She mentioned several proposals they could support, such as “hardening our schools,” putting officers in schools and training volunteer teachers to use guns. But she said a three-day waiting period would not have stopped the Parkland shooter; bump stocks had nothing to do with it; and raising the age limit for gun purchases would be unfair. 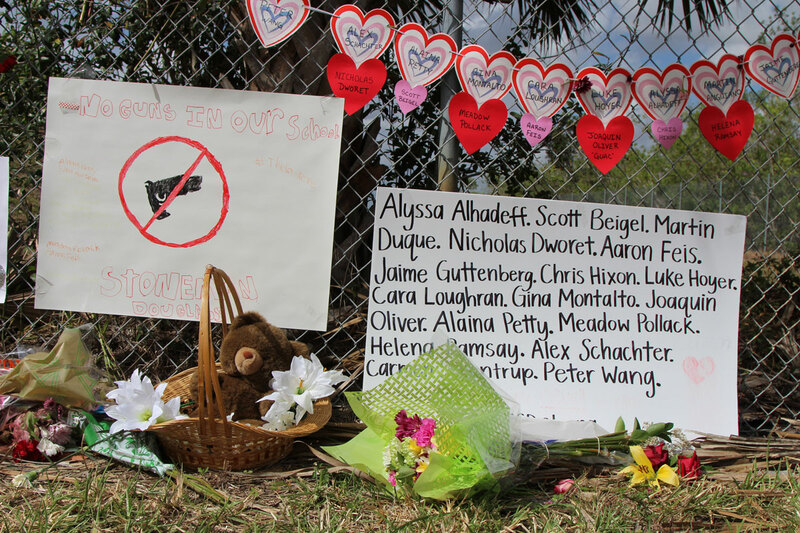 After days of funerals for those killed in the attack, teachers began the emotionally fraught process of returning to the school Friday to collect belongings from classrooms that have been off-limits since the slayings. Following an orientation Sunday for teachers and students, classes resume Wednesday. “I met with one that was grazed with a bullet. … She has a hole in her arm and a bruise from her shoulder to her elbow that looks like somebody whacked her with a bat and she’s like, ‘I’m here because we need to get things ready,’” Fusco said.